Ramon Jefferson of the University of Maine runs the ball into the end zone during Saturday's 35-28 Colonial Athletic Association game at Towson. The Black Bears' ability to execute in the fourth quarter has been a key element of their success this season. The University of Maine football team was haunted by fourth-quarter collapses in 2017. In its six losses last season, UMaine was outscored 58-13 in the final 15 minutes. But the Black Bears’ productive fourth quarters this season have helped lift them to the top of the Colonial Athletic Association standings. UMaine (6-3) improved to 5-1 in the conference to claim a first-place tie with Delaware on Saturday when it received a tiebreaking, 6-yard touchdown run from redshirt freshman running back Ramon Jefferson with 6:29 left. The defense then stopped Towson on a fourth-and-goal at the 4-yard line to preserve a 35-28 victory. It was the third time this season the Black Bears have strung together a game-deciding, fourth-quarter drive. Two other times they manufactured a drive in the final period that provided points to extend a lead. UMaine head coach Joe Harasymiak, whose team was outscored 77-43 in the fourth quarter two years ago, said the experience factor has played an important role in this season’s fourth-quarter success. In the 31-28 win at Football Bowl Subdivision Western Kentucky on Sept. 8, UMaine’s seven-play, 34-yard drive resulted in Kenny Doak’s field goal with 7:11 remaining to extend the lead to 31-21. That enabled UMaine to survive a late Western Kentucky rally as the Black Bears blocked a potential game-tying field goal. A nine-play, 48-yard drive spanning 1:39 enabled Doak to kick a game-winning 52-yard field goal as time elapsed to give UMaine a 13-10 win over Villanova on Oct. 6. The following weekend, a nine-play, 54-yard march in the final 51 seconds set up Doak’s game-winning 39-yard field goal at Rhode Island, again with no time showing on the clock, as UMaine triumphed 38-36. In UMaine’s 28-9 victory over Albany on Oct. 27, UMaine used an eight-play, 75-yard drive — capped by Drew Belcher’s 5-yard TD pass to Julian Dunn with 7:55 left — to sew up the win. 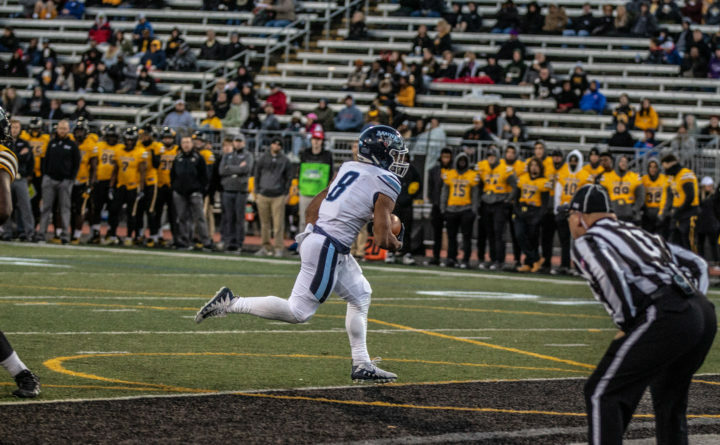 On Saturday, the Black Bears overcame an 18-point rally by Towson to cover 85 yards in nine plays capped by Jefferson’s TD run. Defensive end Jamehl Wiley, with help from linebacker Sterling Sheffield, stopped Shane Simpson short of the goal line to ice it with 1:21 remaining. Harasymiak also credited his coaching staff for the new-found fourth-quarter success. “It’s something we talked about during the offseason,” Harasymiak said. The staff devised a blueprint for handling different situations offensively and defensively, and he said the players have executed at a high level. Jefferson ran for a career-high 121 yards on 21 carries, including a 64-yard touchdown run with 1:49 left in the half that made it 21-7. That was one of three scoring runs in the game for the 5-foot-9, 196-pound native of the Bronx, New York, who was chosen the CAA’s Co-Rookie of the Week. Since returning from a hamstring injury, he has rushed for 294 yards in his past three games, averaging 98 rushing yards per game and 6.3 yards per carry. Jefferson is UMaine’s top rusher (87 carries, 515 yds.) good for 5.9 yards per carry. He has scored five touchdowns. He said the offensive line has done an excellent job blocking for Jefferson. “He is really, really good,” said Richmond head coach Russ Huesman, whose Spiders will host UMaine on Saturday at 3. Harasymiak insisted UMaine won’t be looking past Richmond (3-6, 1-5 CAA) in Saturday’s 3 p.m. game in Virginia with a Nov. 17 regular-season finale against Elon (4-1 CAA) looming. UMaine’s only conference loss was at William & Mary (27-20) on Oct. 20.